The Sepsis Six was developed by the UK Sepsis Trust and involves three treatments and three tests to be carried out once sepsis has been diagnosed. NHS guidelines say these should be carried out within the first hour. To save time in these crucial moments we offer a sepsis bag, box and trolley that keeps all medication and equipment together as a sepsis bundle, ready for the eventuality of a patient needing it. 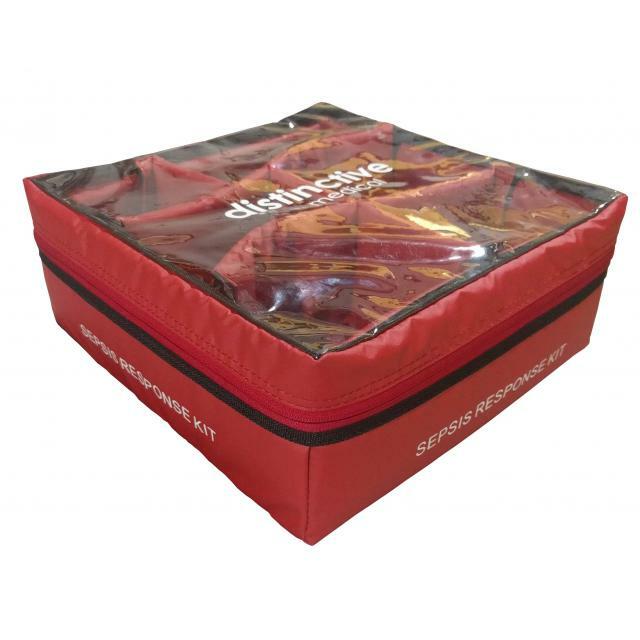 The smallest sepsis bundle storage container we offer is the sepsis bag. This has been developed especially around The Sepsis Six. The easy to wipe-clean bag comes with six removable dividers. The dividers ensure there is a space allocated for all the essentials when treating a patient with sepsis. Due to the compact size of this bag it can easily fit into lockers where it can be stored securely. The contents of the bag can also be protected further by adding a numbered tamper evident seal. The top of the bag is clear so any missing contents can be seen at a glance. A clear pocket on the back can display information such as a hospitals standard operating procedure. As this bag stores only enough equipment and medication for a single use it encourages familiarity among staff of its contents when replenishing it. 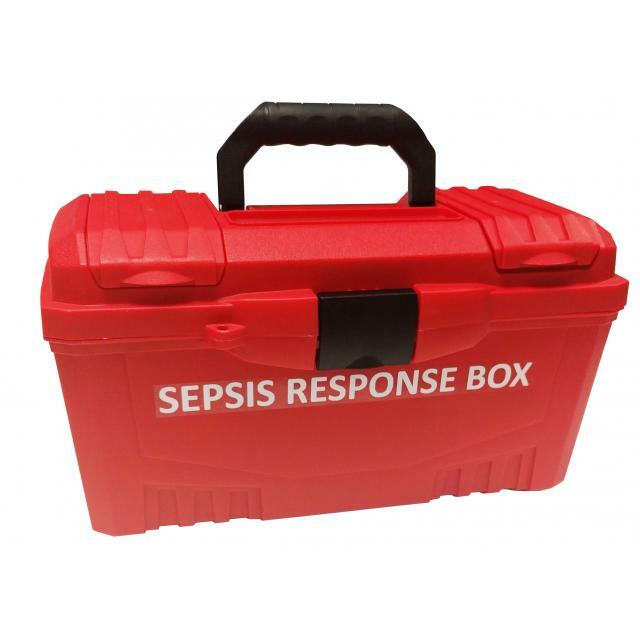 This is our most popular sepsis bundle storage container due to its robustness and being easily identifiable. The box is lightweight and comes with a handle making it super easy to carry and get to a patient quickly. When closed the box can be made tamper evident with either our padlock seal or pull tight seal. These can be fed through the security eyelet when locking the box. This box can be personalised with labels to assist staff when refilling the box and any other information. This trolley has been designed for treating sepsis in acute care. This sepsis bundle container can store enough equipment and medication for multiple treatments. 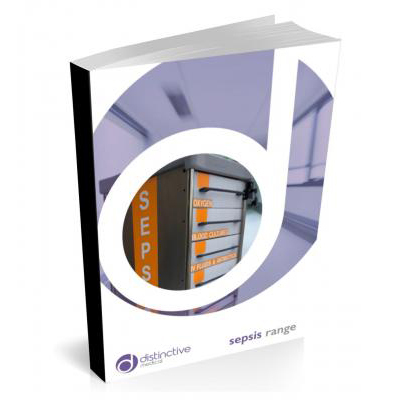 The five drawers have been labelled based on The Sepsis Six guidelines. 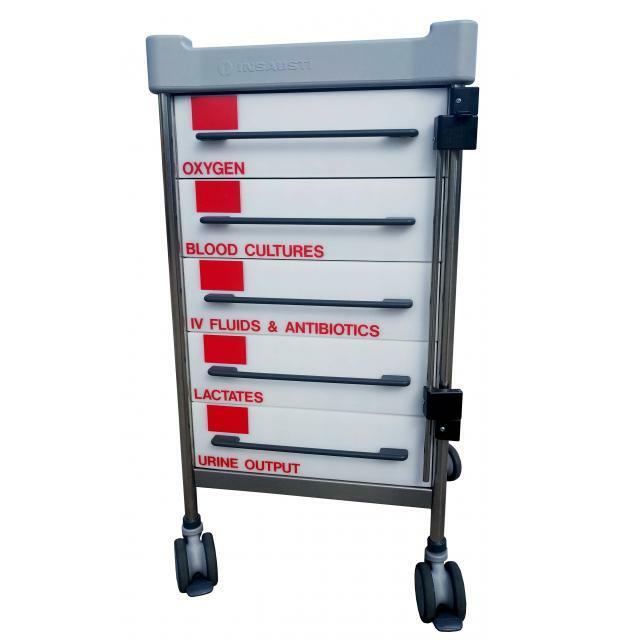 The trolley can be arranged and labelled to suit standardisation across departments and sites. The trolley is available with either a key lock or tamper proof seal lock. Tethers are also available from us following the UK requirement that when a trolley is not in use that it must be secured to the structure of the building. The sepsis trolley is durable with a work surface made using HDPE polymer plastic and has a warranty of five years.